So we're almost half way through March and, theoretically, I'm about half way through my Monster March pledge. For those that don't know, Monster March is a painting challenge run by Swordmaster over at Path of an Outcast. The basic gist is to paint something large and monstrous in the month of March. 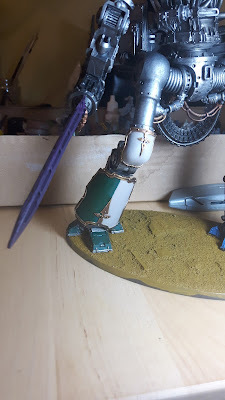 I have chosen my Cerastus Knight Castigator which has been hanging about for a few months. So, what's the current state of play? Well, I think that's best described as, work in progress. 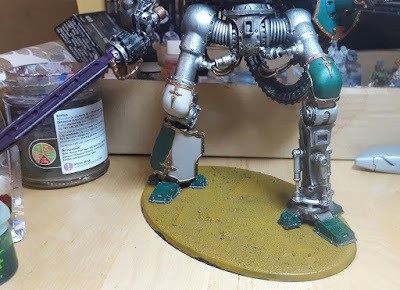 The next job is to complete the left leg and then the entire lower half of the model will be finished (except for the base.......and the transfers....oh dear) Hopefully you can see that the left leg is progressing reasonably well too and should be finished before too long. 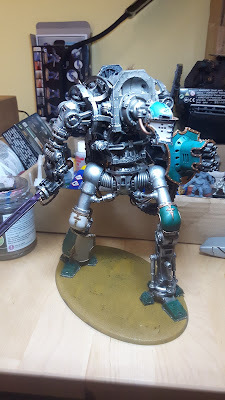 I was fortunate enough to have a bit of a painting day with Blazmo over at Tabletop Apocalypse last weekend which really gave me a boost on the progress front. Conversely, I have been a bit under the weather and have a busy week of gaming this week so my daily progress has been slow. Still, my Excel spreadsheet (because I am just that sad) tells me I'm about 50% through painting this beast, so I'm still on track for the end of the month. Here's hoping that next weekend brings another good shot of painting power. As usual, you can check out my previous Monster March posts here and here. Good luck to all my fellow participants, your work is an inspiration as always! You are the machine, Ed! :) I really admire your steady progress and every time you post about it there is a huge leap forward! Well done indeed! The model looks fantastic already, thanks a lot for sharing the WiP pictures. Cheers! To be the machine is to be one with the Omnissiah. :) Seriously though, thanks a lot. Here's hoping for a good update next week. Cheers Cylde. Your Baneblade is looking good too. Good job, that is some solid work on it so far. Nice movement in the pose and all. Thanks Rory. The pose was a little tricky as the torso and left arm had already been assembled. However, a little creativity with the leg positions left me with a good result.